Asus has quite a few Zenfone 4 models to launch and we expect the base Zenfone 4 to come out this month. We should warn you, though, it’s not going to be cheap. Rumor has it that Asus will be charging around $400 for a Zenfone 4 (ZE554KL) with a Snapdragon 630 chipset, 4GB of RAM and 64GB storage. We don’t have a full picture of the specs yet, but we know it will have a dual camera and that it will be unveiled on August 17. There should be a model with Snapdragon 660 as well, if you need more power. Then there’s the Zenfone 4 Pro, a serious piece of hardware. The expected price is $650, for that you get Snapdragon 835 with 6GB of RAM and 64GB storage. And a 5.7” AMOLED display with QHD resolution, plus a dual camera with 2x zoom, proper flagship stuff. There are at least four Zenfone 4 models in the works, the Max is already official, then there are the two models above and, finally, the Zenfone 4 Selfie. 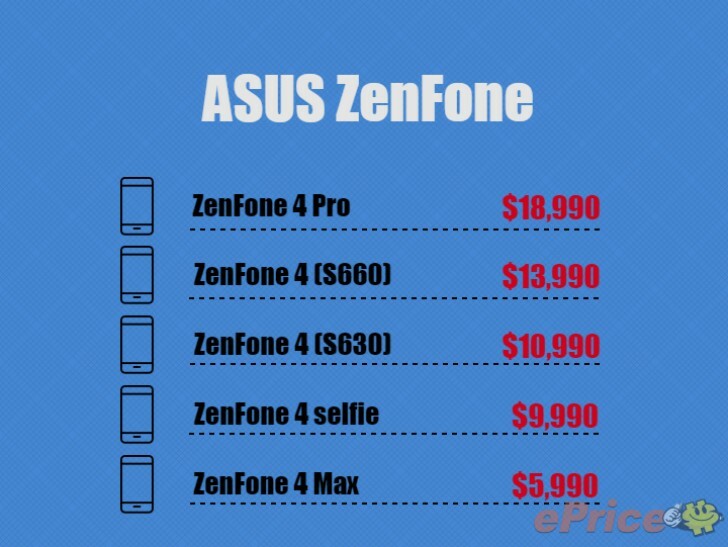 Here are their prices for Taiwan, the Selfie costs just about the same as the base Zenfone 4. WOW another zenfone 5 user!! Yeah, I'm going to replace it too later this year. I need LTE and better battery. What would you replace it with?